Google Developers Live (GDL) is designed to bring you great technical content, live as it happens and archived for whenever you need it. 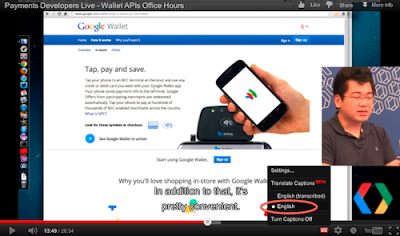 We want GDL to teach you about our tools and platforms, but Eiji Kitamura, a Google Developer Advocate in Tokyo, had another idea: use the captions on GDL videos as a tool for picking up English while learning about technology. As Eiji says, “Learning English and technology at the same time is a killer feature, because it is time efficient, practical, and enjoyable”. For the best translation, make sure English is selected (shown circled in red). For the best translation, click the CC button and make sure English is selected (shown circled in red in the image above), and not English (transcribed). The English translations are usually available about a week after each event. Eiji posted about this idea on the Google Developer Relations Japan Blog, and it proved to be very popular, so several other Googlers around the world picked up the thread and created their own versions of the post, translated into Korean, Spanish, and Hebrew, with more translated posts in the works. If you’re a developer learning English while studying a new technology, now you can absorb both at the same time. Finally, if you need some new gaming fun this weekend, check out Ingress, a game that takes place online and in the physical world. Just be sure to stop playing and come back to your family at some point. On Fridays we depart from our usual fare of new tools and events, and instead tell you about general cool stuff you might find interesting. This week we’re wondering: are you disappointed to learn that millipedes don’t really have 1000 legs?